After compiling a regular-season record of 26-5-8-13 and then winning the first round and the first game of the semifinal, Oceláři Třinec lost 3 games in a row to Slavia Praha and found themselves needing to do the same in order to advance. They took the first step toward that goal with a dominant 6-1 victory on home ice on Monday night. They were led by 4 goals from Martin Růžička, who now has 13 goals and 22 points in 11 playoff games, making him the runaway leader in both categories. Růžička scored once in the first and twice more in a 1:13 span in the second period to complete his natural hattrick before the game's midpoint. Slavia's best chance to get into the game was early in the second when, trailing 1-0, they had a two-man advantage for 1:17. Not only did they fail to score, but the best chance belonged to Třinec, when Martin Adamský intercepted a pass and got a short-handed breakaway, only to be denied by Miroslav Kopřiva. Otherwise, it was not Kopřiva's night, however, as he was beaten for 5 goals on 20 shots, before being lifted in favour of Dominik Furch after Růžička scored his fourth of the night at 12:28 of the middle frame. At the opposite end of the ice Peter Hamerlík was seeking his second shutout of the playoffs until he was beaten by a perfect shot by Slavia's Lukáš Endál with 3:31 remaining. 25-year-old Růžička played two seasons in the WHL with the Everett Silvertips and Lethbridge Hurricanes, but recorded only 16 and 10 points, respectively, and was never drafted. His first four years in the Czech Extraliga with Sparta Praha and Orli Znojmo were equally unproductive, though he was part of a championship team with Sparta in 2007. The last two seasons he has really blossomed into a top scorer, recording 47 and 50 points, respectively. He led Třinec this year in scoring with 24 goals and 26 assists, and was fifth overall in the league. "I'm obviously pleased about the goals. This time they went in for me. It was very nice, but the main thing is that we won," Růžička said of his performance in the do-or-die game. "We knew that we could succeed if we got back to playing the way we did before when we won. Now we have a second key game. But we have a lot of energy, there is nothing to save it for. Let's go to Prague and lay it all out there and win." The series continues Wednesday night at Prague's O2 Arena. The game begins at 18:10 and will be televised live on ČT4. 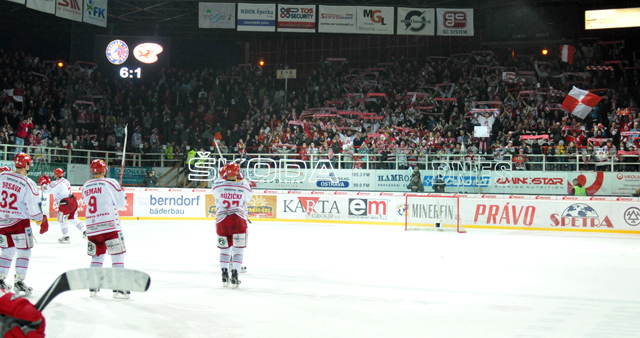 If necessary, a seventh game will be back in Třinec on Friday night.